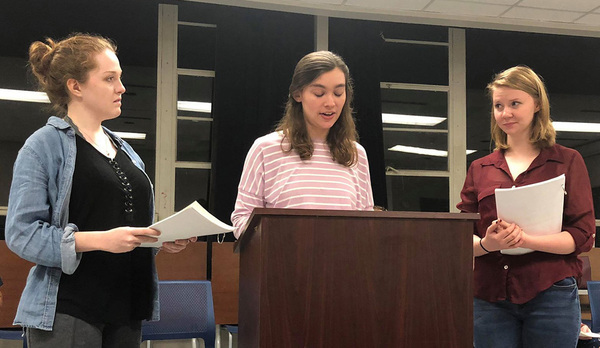 SFA theatre students Aubrey Moore, Abigail Junk and Haley Gibbs rehearse a scene from "Hot Flashes," SFA Playwright-In-Residence Jack Heifner's adaptation of Barbara Raskin's best-selling novel. "Hot Flashes," S. Denise O'Neal's "Sorry, Not Sorry" and Ted Swindley's "… And the Pursuit of Happiness 1994" will be presented as part of the School of Theatre's Festival of New American Plays April 24 through 28 in the Downstage Theatre. Tickets are selling quickly for the biennial Festival of New American Plays at Stephen F. Austin State University. The popular staged-reading event, slated for 7:30 p.m. Tuesday through Saturday, April 24 through 28, and at 2 p.m. Saturday, April 28, in the Downstage Theatre, almost always sells out for each performance, according to Jack Heifner, director of the festival and SFA's playwright-in-residence. "Many of our audience members share our excitement about new plays and return every two years," Heifner said. "Seeing three new works by three invited playwrights in one week is a unique theatrical experience. To our audiences, nothing is a thrilling as being in the theatre with the playwrights when they are seeing their plays for the first time." Presented by the SFA School of Theatre, the festival, in its 11th season, will present exciting new works by guest playwrights S. Denise O'Neal and Ted Swindley, as well as Heifner's adaptation of a best-selling novel by the late Barbara Raskin. The plays will be performed as "staged readings" that involve audiences and actors in the process of new play development. "Plays are meant to be performed, and the best way to see whether a new play works is to present it in front of a live audience," according to Heifner. The actors will perform with the script in their hands, relying on their talent and training to interpret the text without the advantage of a long rehearsal process, Heifner explained. "These readings have been designed to concentrate on the words of the writers and the talents of our young performers and designers," Heifner explains in his director's notes contained in the festival program. "We have included a minimal amount of scenery, costumes and lights to give the writers what they envisioned in their scripts. "We attempt to present the world of the play as closely as possible to what the author has written," he added. "The results may be a different type of theatre from what most audiences are accustomed to seeing. Our hope is that those who attend will find the event both adventurous and exciting." One of Heifner's goals when he started the festival in 1998 was to bring established writers to the university campus to work with theatre students. In the past, SFA has welcomed such famous American writers as Tina Howe, David Ives, Carol Hall, James McLure, Beth Henley, Gretchen Cryer, William M. Hoffman, Barbara LeBow, John Cariani, Staci Swedeen and Constance Congdon. "We have always asked our invited playwrights to send us any script they wished to hear and, in return, we have promised to give them our best interpretation of the text," Heifner said. "Another goal has been to give audiences in Nacogdoches the unique opportunity to see new plays while they are being created. "Our first 10 festivals were great successes," he said. "Now with this 11th festival, I hope the community will once again enjoy this celebration of new theatre in the making. "This year's festival features "Hot Flashes," which is Heifner's adaptation of Raskin's best-selling novel, along with "Sorry, Not Sorry" by S. Denise O'Neal and "… And the Pursuit of Happiness 1994" by Ted Swindley. The festival opens with Heifner's "Hot Flashes," which will be read at 7:30 p.m. Tuesday and Friday, April 24 and 27. O'Neal's "Sorry, Not Sorry" will be presented at 7:30 p.m. Wednesday, April 25, and at 2 p.m. Saturday, April 28. Swindley's "… And the Pursuit of Happiness 1994" will be presented at 7:30 p.m. Thursday and Saturday, April 26 and 28. The Downstage Theatre is located in the Griffith Fine Arts Building, 2222 Alumni Drive. For more information, visit theatre.sfasu.edu. Tickets are $15 for adults, $10 for seniors and $7.50 for students and youth. For tickets, call the SFA Fine Arts Box Office at (936) 468-6407 or visit www.finearts.sfasu.edu.